Mark and Louise had not appreciated how quickly the cliffs erode. In 1832, Belle Tout was built about 30 m (100 ft) from the edge. Its location was set so sailors would see the light disappear behind the cliff if they came too close. 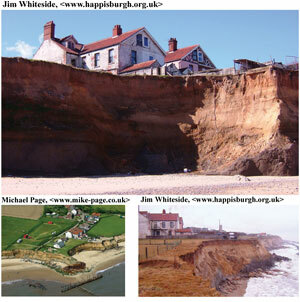 On average, the sea has eroded one metre of the cliff every six years. 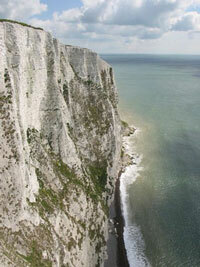 In fact, erosion keeps the cliffs white by preventing grass, shrubs and trees from growing. The Roberts are not alone. Most people don’t appreciate the significance of erosion, and how quickly land is disappearing into the briny deep. Whole villages on the English coastline have been lost, and locals are used to seeing houses teeter on the edge. Mainstream geologists say the billions of tiny crushed shells that make up the White Cliffs of Dover were deposited during the Cretaceous period (the age of chalk) that concluded 65 million years ago. It’s instructive to do a simple calculation. If the cliffs have been eroding at one metre every six years since the end of the Cretaceous, more than 10,000 km of coastline would have eroded away. That’s like the distance from London to Cape Town, or nearly from Los Angeles to Sydney, Australia. People speak about millions of years so easily. It rolls off the tongue. But when we think about what these unimaginable eons of time actually mean, we find they do not match what we observe. The erosion we see on the coastlines all over the world is not consistent with the idea of millions of years. It is consistent with a process that has only been working for thousands of years, since the end of the global Flood described in the Bible—a process that started about 4,500 years ago. 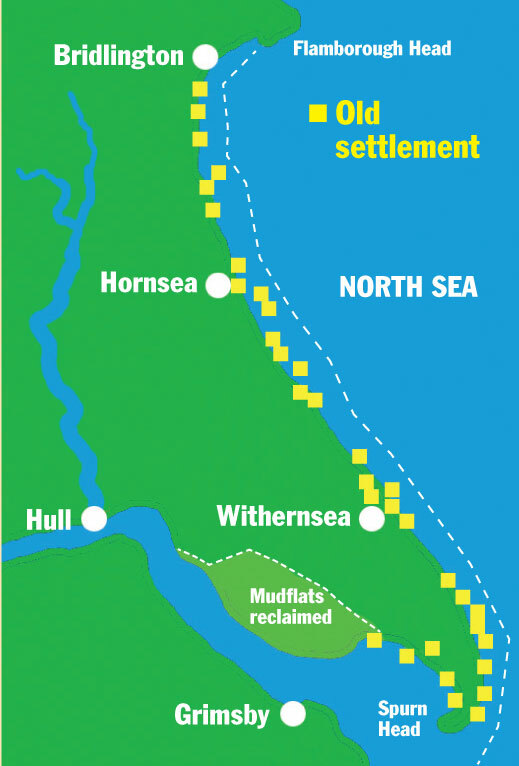 Since Roman times, the sea has eroded some 3 km of the mid-east coast, destroying many villages in Humberside, UK.1 On average, about 1.5 m of land has disappeared every year. One million years at this rate would see 1,500 km eroded, more than the entire width of England and Ireland. Clearly, this rate of erosion has not been going on for that long. Coastal erosion does not fit with millions of years, but with the timeframe of the biblical Flood, which ended about 4,500 years ago. The Earth in our hands—how geoscientists serve and protect the public, The Geological Society, London, UK, 2001, www.geolsoc.org.uk/pdfs/coastal%20erosion%20aw.pdf, 24 October 2005. Phillips, A., Tall Order: Cape Hatteras Lighthouse makes tracks, National Geographic 197(5):98–105, 2000. Pierce, L., Niagara Falls and the Bible, Creation 22(4):8–13, 2000; also <www.creation.com/niagara>. The national atlas, shoreline erosion and accretion map, US Geological Survey, US Government Printing Office, Washington, DC, 1985. Coastlines down under in Australia are constantly changing too. 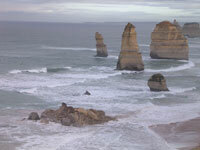 In January 1990 one of the tourist attractions off the southern coast of Victoria crumbled without warning.1 Part of a double-arched rock bridge called London Bridge, collapsed seconds after two people had walked across, leaving them stranded high above the ocean on the newly created stack. They were plucked to safety by helicopter. Without a helicopter, it is hard to imagine how they would have been rescued from 50 m (160 ft) above the ocean. In July 2005 another rock-fall in the same area caught the attention of the nation. 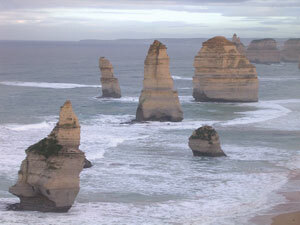 One of the famous rock formations called the Twelve Apostles collapsed into the foaming waves, leaving only eight still standing.2 Everyone is told the coast started forming 20 million years ago, so the dramatic disappearance of the rocky landmark caught people by surprise. One ranger said he did not expect erosion to happen in his lifetime. Obviously erosion has not been going on for millions of years. Mickelburough, P., Apostle falls to make it eight, <www.heraldsun.news. com.au/common/story_page/0,5478,15811701%255E661,00.html>, 26 October 2005. Walker, T., ‘Twelve Apostles’ shock! 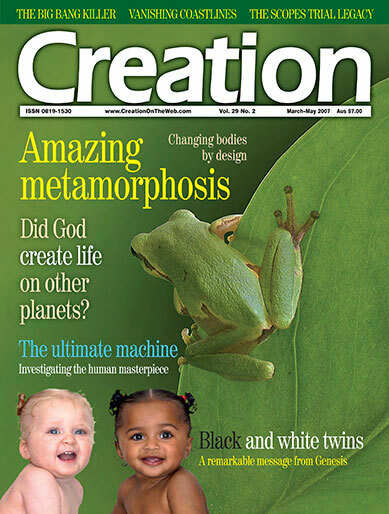 Creation 28(1):33, 2005. 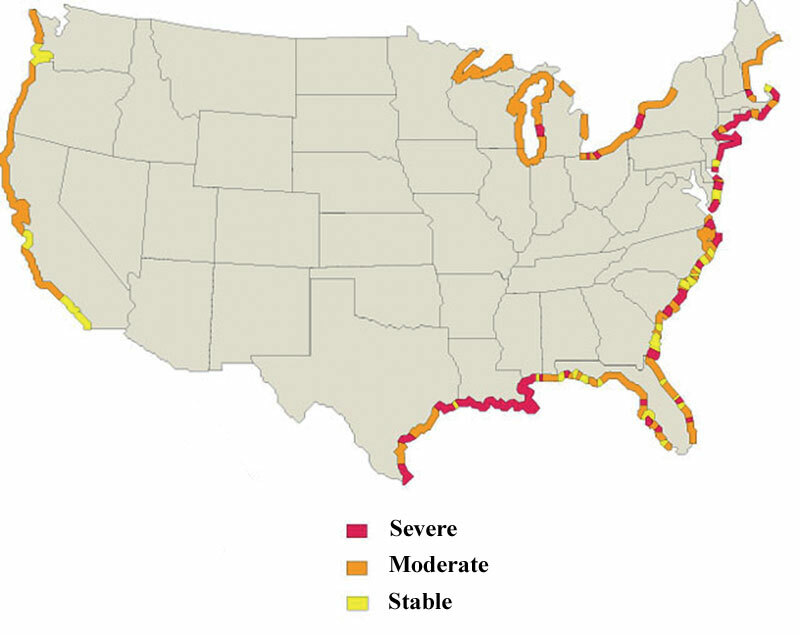 Coasts eroding for millions of years? 27 December 2000. Nearly 2.5 km of the 45-m-high cliffs at Charmouth, Dorset, collapsed. 2 January 2001. One person was killed as landslides at Nefyn, North Wales, swept a parked car into the sea. 26 January 2001. A section 200 m wide and 100 m deep of the White Cliffs of Dover, Kent, collapsed, taking a public footpath with it. 21 March 2001. The slope behind a hotel and flats on the Isle of Wight collapsed. 3 April 2001. The Devil’s Chimney, a 70-m high chalk stack, toppled over at East Sussex. 9 April 2001. Thousands of tonnes of debris from a cliff fell just short of a supermarket at Brighton. 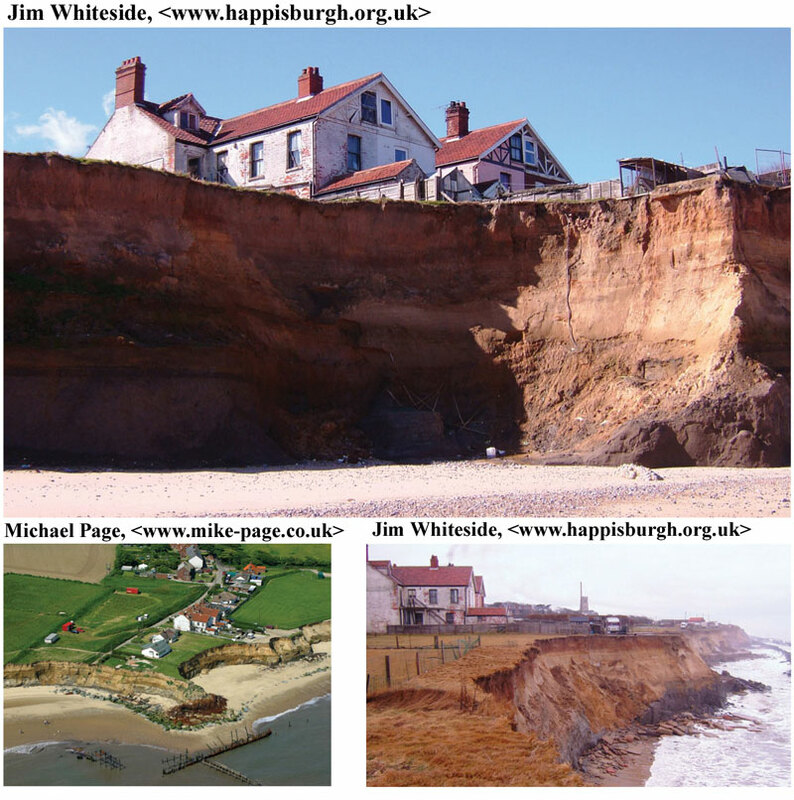 The Earth in our hands—how geoscientists serve and protect the public, The Geological Society, London, UK, 2001, <www.geolsoc.org.uk/pdfs/coastal%20erosion%20aw.pdf>, 24 October 2005. Moving the Belle Tout Lighthouse, BBC online, 17 March 1999, <216.122.217.223/b/megalab/movingbelle.htm>. Return to text. Race to save lighthouse from sea, BBC online, news.bbc.co.uk/1/hi/uk/215026.stm, 24 October 2005. Return to text. Back from the brink, www.shu.ac.uk/alumni/hallmark/12/profile.html, 24 October 2005. Return to text.